These are meant to squish Sonic in the final game, killing you in one hit, regardless of ring consumption. 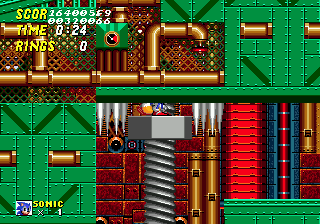 In the Beta Sonic is simply stuffed into the bit of zone above, and comes down with the squishers. The versions of these that come from above will kill Sonic though. These pistons are quite weak in the final. 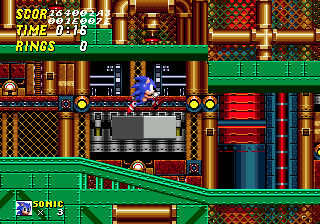 They're meant to spring Sonic to the next platform above, but here they can get about half way up. 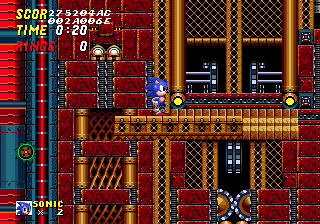 If Sonic stands on the platforms which are activated by a switch when they retract, he'll get sucked into the wall like this. The rotating nets work to an extent. 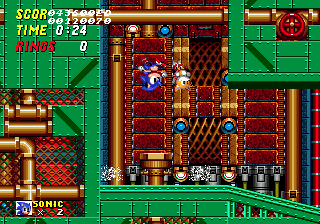 They can make Sonic go around, but sometimes he'll fall from the top rather than continue the cycle. It sometimes make Sonic fall out of it for no reason as well. 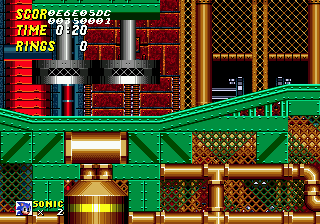 The cork screws just don't want to stop in Sonic 2 Beta, you can continue to whirl them upwards regardless of walls, and Sonic will not die. 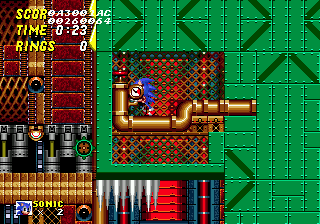 If you debug yourself through some walls, you can make the screws continue up with nothing holding them. 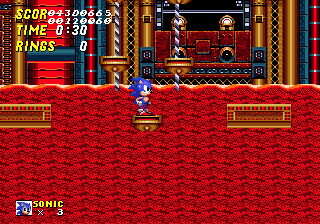 In Act 2, Sonic cannot be hurt by lava, and can walk over it easily. He can also become completely submerged with no harm done to him. 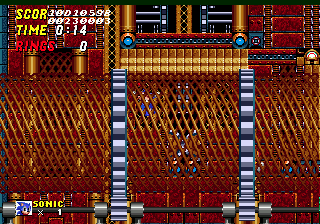 This area is a little weird, there is no room for Sonic to actually egt through without spindashing. 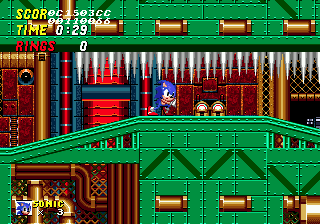 Sonic can lean onto the spikes with no problems, but can only go under by spinning. 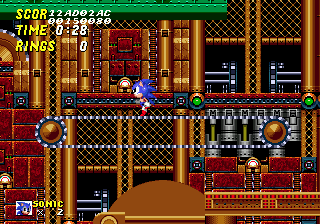 The lift, something taken out of the Metropolis zone in the final, would push Sonic through strange, diagonal areas to get to new sections. They're similar areas in Act 2 and 3 of Scrap Brain Zone. 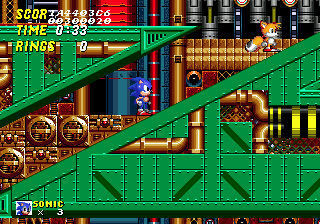 Unlike the conveyor belts in Wood Zone, the ones in Metropolis do work like the final ones. 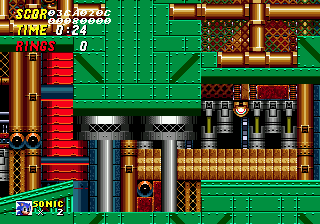 In the final this platform would float to the right until you got to another area where you would face Eggman. In the Beta it just continues going, until it reaches the end of the map where Sonic simply dies.